I’m a 90s kid…and the 90s fashion trends hold a special place in my heart. I think it has to do with the fact I have two older brothers who were teens in the 90s. While I listened to Spice Girls with my friends in school (and wanted to dress like Sporty Spice), I would get home and listen to Nirvana with my brothers…and after a day of Nickelodeon cartoons, I would join them for Dawson’s Creek and Beverly Hills 90210 (now that I watched those shows as an adult, I get while my mom wasn’t happy that).I remember being into grungy looks with flannel shirts and chokers. The best part about fashion is that trends ALWAYS come back, and it’s always fun to modernize those trends and give them a “now-twist”. I think the best way to ROCK the 90s trends is to have that “Totally, Whatever…I’m too cool to care” attitude of the decade. You can add 90s pieces easily to your current wardrobe. I of course went with a super cool bodysuit from Express, I love how the detail on the neckline gives it a modern twist to this style. 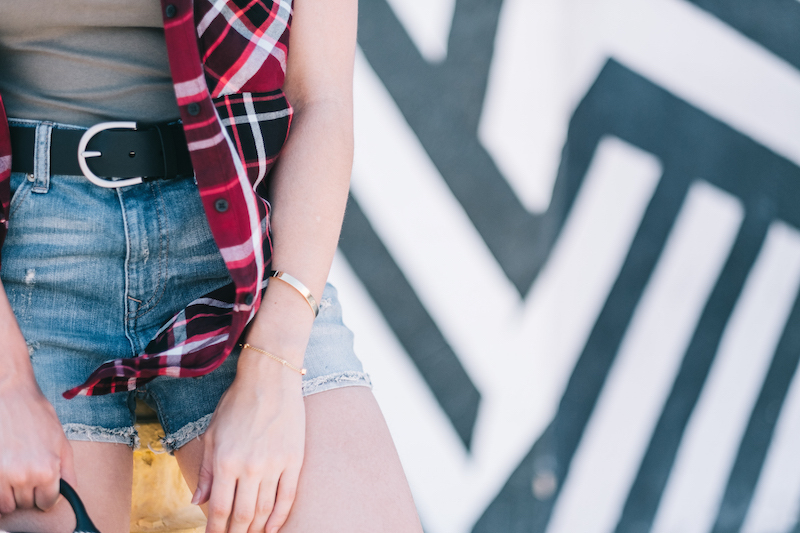 But well, it’s not the 90s without PLAID! I really liked this short-sleeve version that looks great over the bodysuit! To get ready for Spring/Summer, go for high-waisted shorts with a cool buckle belt. When it comes to accessories: instead of the retro tattoo version, try a silver or gold version. I love this silver choker from Express, it’s so versatile…you can dress it down with the flannel, or up with a gown for a wedding. 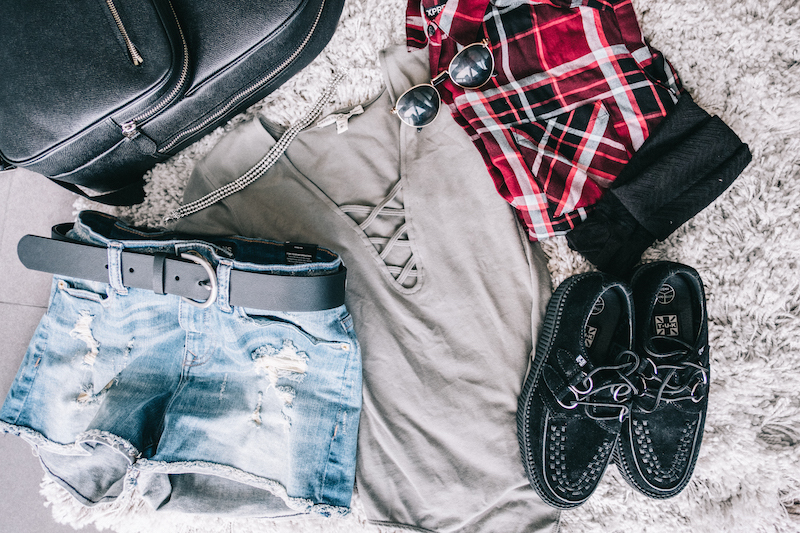 And well, backpacks and a chunky shoe are the perfect complement to any 90s look! Instead of perfect curls or beach waves, go for a tousled look. To do this, use a wide curling iron and leave the ends straight…then mess the look with your fingers. Keep makeup to the minimum, but it’s always a great idea to add a burgundy or dark lip! Would you go 90s for Summer? 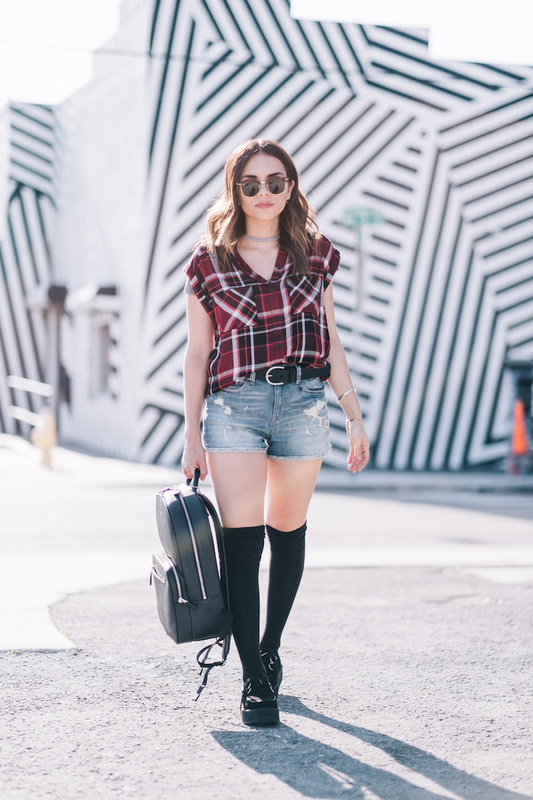 Check out some of my favorite Express 90s inspired pieces below! Los 90s tienen un lugar especial en mi corazón.. es esa época de "cuando éramos felices y no lo sabíamos". Las tendencias de los 90s todavía me encantan, creo que tiene que ver con el hecho de que tenía dos hermanos que eran adolescentes en los 90s. Y mientras escuchaba a las Spice Girls con mis amiguitas en colegio...luego llegaba a la casa a escuchar Nirvana con mis hermanos. Y después de ver las comiquitas de Nickelodeon, los acompañaba a ver Dawson's Creek y Beverly Hills 90210 (ahora de adulta, ya entiendo porque a mi mamá no le gustaba mucho la idea jaja). Me encantaban esos looks grunge con camisas de cuadros y gargantillas. Pero lo mejor de las tendencias es que siempre regresan... y a mi me parece super divertido darle un toque moderno a esas tendencias del pasado. Si quieres intentar la tendencia de los 90s, lo primero que tienes que hacer es tener una actitud de "Totally, Whatever...no me importa nada". Pero es super fácil agregar piezas noventas a tu guardarropa. Yo en este caso lo hice con un body de Express..que justamente el detalle en el cuello le da ese toque moderno. Pero bueno, sabemos que los 90s no son 90s sin un poco de TARTAN. Me gusto mucho esta versión manga corta que me pareció que iba genial con el body...y es más fresca para la temporada de primavera verano. A mi me encantan los shorts a la cintura, esta vez le agregué un cinturón con la hebilla ancha. Cuando se trata de accesorios, si quieres optar por una versión más moderna de las gargantillas: busca una que sea dorada o plateada en vez de las que parecían tatuajes (a mi me encantan pero hoy en día hay gargantillas para todos los estilos). Esta gargantilla plateada puede ser usada con un look casual como este, o hasta con un vestido largo para una boda. Y si quieres tener un look aún más novelero, usa un morral y zapatos con plataforma. ¿Les gustan las tendencias noventosas? Yo levanto la mano jaja. Abajo les dejo algunas de mis piezas favoritas de Express. Great fashion look, love the necklace! AMO los 90. Totalmente noventosa soy yo. En estos dias estaba viendo por netflix WISH UPON A STAR (tenia como 10 anos sin verla) y me dije AHHH YA ENTIENDO TODO. Jajajja el porque compro tantas cosas parecidas de la epoca. Yo ADORO Dawsons Creek (sigo a James todavia por todos lados) y ni se diga 90210. jajajaj. Este lOOK TOTAL FAVORITO. Me llevo todoooooo. Besitos bella y espero te este iendo super en el evento. Con ganas de conocerte pronto! 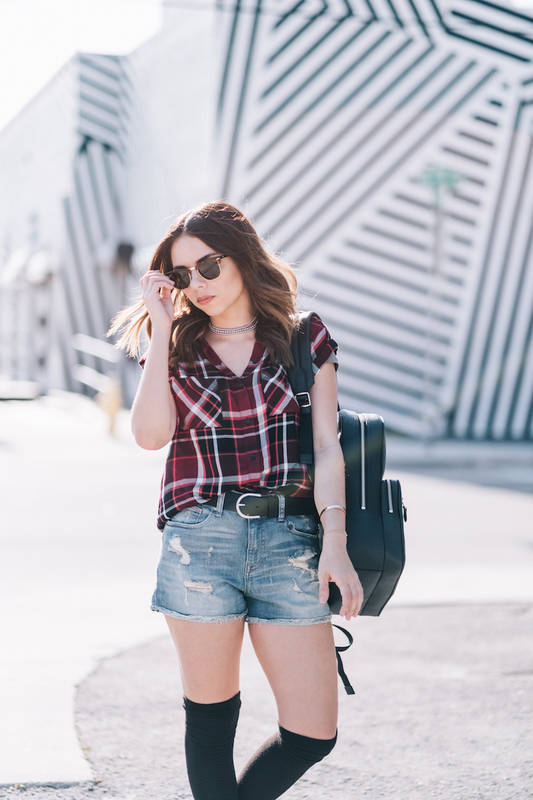 This plaid top is genius - you look incredible in it. Perfect for spring!